This year, 2018, marks the 75th anniversary of the Broadway opening of the pioneering stage musical “Oklahoma!”, the first collaboration on such a project between Richard Rodgers and Oscar Hammerstein, with Rodgers’ previous writing partner Lorenz Hart on a downward spiral towards the end of his life. Like Hammerstein’s earlier innovative show written with Jerome Kern, “Showboat”, “Oklahoma!” was one of the first musical to develop the idea of an integrated “book musical” where the songs and dances are a part of the logical progression of a plot which has serious dramatic objectives, rather than just a flimsy vehicle for a glorified revue. Many people thought it was a huge risk – producer Mike Todd said after a preview “No legs, no jokes, no chance, but the show was an unprecedented success running for a record-breaking 2,212 performances and being turned into an equally successful movie starring Gordon MacRae in 1955. Hammerstein, always a writer with a social conscience, but who was very much a sentimentalist and a keen observer of American social issues, saw that in the era after the depression and the Dust Bowl disasters, with a need for American people to work together to rebuild the American dream once WWII had ended, saw the re-working of Lynn Riggs’ 1931 play “Green Grow The Lilacs”, focusing on the conflicting attitudes of arable and livestock farmers, as a metaphor for that process. 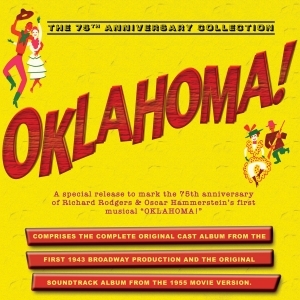 This commemorative 75th anniversary comprises original cast recordings from the 1943 St. James’ Theatre Broadway production plus recordings from the original soundtrack of the 1955 film – an interesting contrast of styles and treatments, but both providing nostalgic and evocative entertainment for every lover of musical theatre, featuring landmark songs like “Oh What A Beautiful Morning”, “People Will Say We’re In Love” and “Surrey With Fringe On Top”, and the anthemic title song.